The Clan Cameron Museum is a place of pilgrimage for members of Clan Cameron from around the world, and provides a fascinating insight into an important part of the story of Lochaber for the rest of us. It can be found some seven miles north west of Spean Bridge, along single track roads that leave the main A82 at the poignant Commando Memorial. 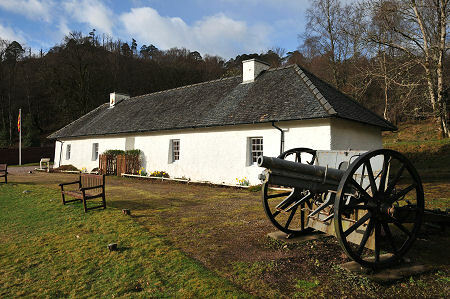 The museum occupies a traditional building looking across parkland to Achnacarry Castle. To one end of it is an artillery piece captured by the Queen's Own Cameron Highlanders at the Battle of Loos, during World War I. Not far from the other end, above the car park, is the Cameron Cairn, built using stones provided by clan members from many parts of the world. Many of the stones were inscribed before being built into the cairn by international branches of the Clan Cameron Association. Within the museum you find a series of rooms laid out in a highly effective manner. Topics covered include the story of Prince Charles Edward Stuart, "Bonnie Prince Charlie" and the 1745 uprising. Clan Cameron supported the uprising, and not far from the museum the consequences of this can be seen in the form of the very partial ruin of the original Achnacarry Castle, destroyed by government troops in 1746. Included in the items on display is one of Prince Charles' waistcoats, and a Jacobite ring. An earlier Jacobite uprising is remembered by the presence in the museum of the boots worn by Sir Ewen Cameron, the 17th clan chief, at the Battle of Killiecrankie in 1689. Clan Cameron's military links are represented in many parts of the museum. The story is told here of the Queen's Own Cameron Highlanders from their formation in 1793 to their more recent amalgamation with other Scottish regiments. Also on display is a Cameron of Erracht regimental kilt that was originally issued to an officer of the Queen's Own Cameron Highlanders. This was among the last of a very long line of kilts to be worn in action by soldiers of the Highland regiments when it was in use at Dunkirk in 1940. Another display commemorates the clan's links with the commandos. These were more geographical than genealogical, as from early 1942 Achnacarry Castle was used as the Commando Basic Training Centre, a place where volunteers from regiments throughout the Army, and later the Royal Marines, were moulded by an exceptionally tough training program into men fit to wear the green beret and take the war back into occupied Europe and beyond. It is difficult to believe today, but as you look across the parkland to the front of Achnacarry Castle, you have to imagine this as home to over 50 Nissen huts and other buildings. During the training centre's active life some 25,000 men were trained here, including men from many parts of Europe (even some Germans) and United States Rangers. Information about the Commando Basic Training Centre is available in the museum, as is a leaflet describing a "Commando Trail". 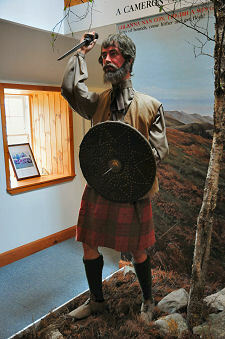 The Clan Cameron Museum is far more than just a military museum. You can find information and displays here about the modern management of the surrounding Lochiel Estate, about Clan Cameron legends and history, and about famous Camerons. One very striking exhibit is the bridesmaid's dress worn by six year old Catherine Cameron, the daughter of 27th Clan Chief Donald Angus Cameron of Lochiel, at the 1981 Royal Wedding of HRH The Prince of Wales and Lady Diana Spencer. Those looking for more in-depth information can explore the wealth of background and genealogical material available in the Clan Records Room, while the shop has a range of books and clan memorabilia, including items made in Cameron tartans. Plus cold drinks and ice cream for those warmer days. 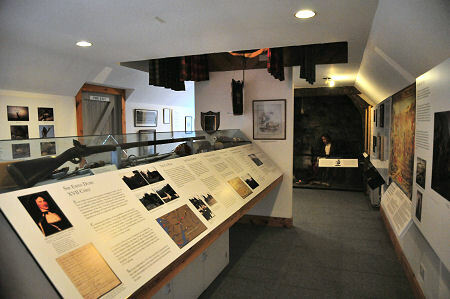 The Clan Cameron Museum was established in 1989 by Donald Cameron Younger of Locheil and his wife Lady Cecil Cameron with the enthusiastic support of the clan chief. It was extended in 1998.